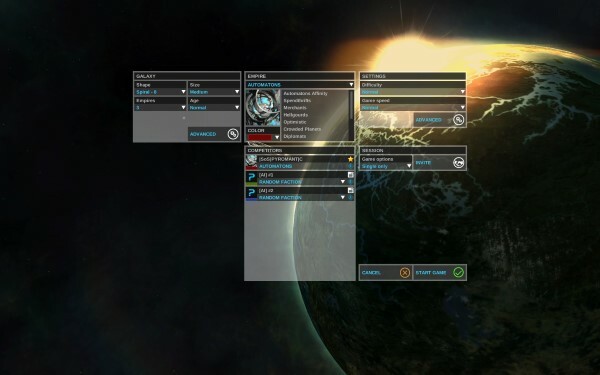 Endless Space: The Galaxy Is Yours, Should You Want It. I’m no stranger to turn based strategy games but I can’t say that they’re my favourite genre. Whilst I, like many of my generation, grew up on titles like Civilization, Alpha Centauri and even more esoteric titles Warlords I can’t say that I’ve sought any of the more recent instalments that some of those games have. Long time readers will know that I’m much more partial to real time strategy, preferring the intense encounters that last at most an hour or so rather than the calculating, often multiple hour long games that turn based strategies tend towards. Still I’m a sucker for anything space related and when Endless Space came on sale recently I felt compelled to give it the once over. 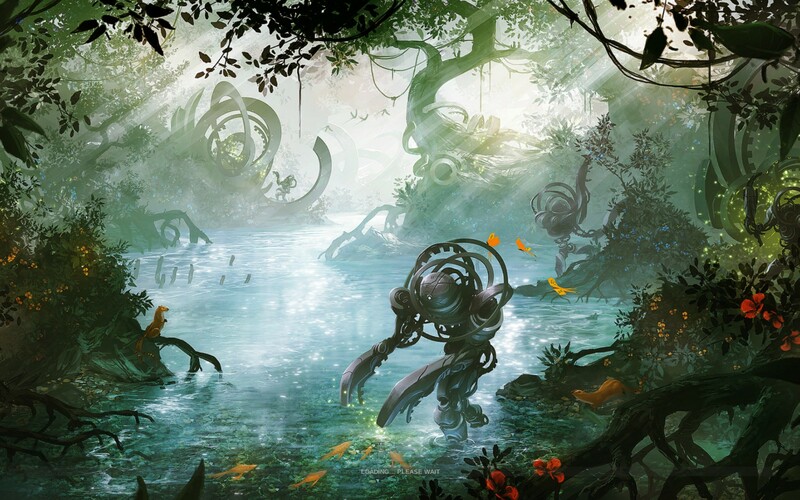 Endless Space takes place in the distant future of 3000AD where you take control of one of 9 species (or even one of your own should you choose) competing with others in order to colonize the galaxy. Depending on your race your motivation for expansion can range from simply wanting to tend to these worlds and see them flourish to conquering everything that stands in your way, ruling over it with an iron fist. Realistically the story is left up to you to create as the process of expansion, diplomacy and war will build your own unique story within the Endless Space world. 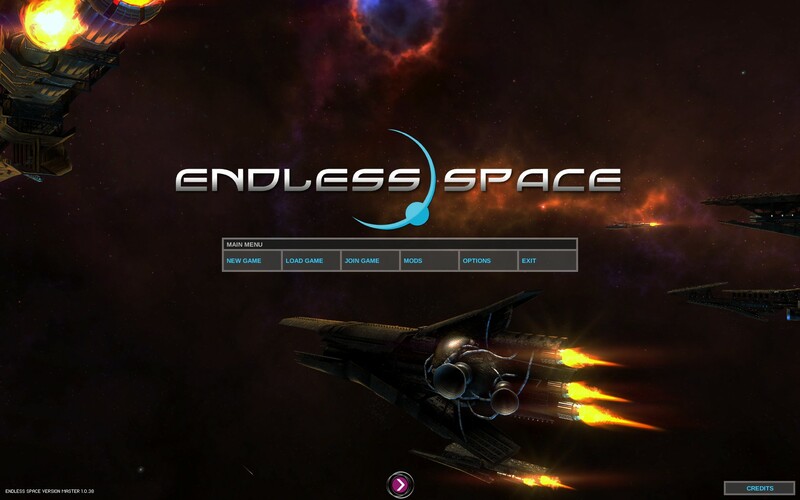 Graphically Endless Space is somewhat simplistic but vibrant enough so that you don’t get bored with it. Most of the planets look pretty much identical except for when they have some kind of anomaly on them and the ships differ between each race but they all have their own distinct style about them. The music was also quite good with the general background tracks having invoking this feeling of wonder as you click through your planets and line up tasks on your quest to conquer the galaxy. Overall it’s not bad, just very simple in comparison to many other space based games that have been available recently. There’s no campaign to speak of in Endless Space, rather you’re given a whole bunch of options to create a game world which you can play in. You get control over a pretty wide range of parameters including things like galaxy type and size, number of opponents and the speed/difficulty of the game. You also get your choice of race, from a total of 9 options, but if you’re so inclined you can also create your own race with its own set of benefits/disadvantages. This can be quite fun if you want to try out playing in a particular way as the races that are best designed for colonization might not be the best for war (and vice versa). The galaxy is then procedurally generated meaning that no 2 game worlds will be exactly the same (unless you use the galaxy seed number in order to recreate it). You’re then placed on your home system, typically a system that has a full set of planets, and given a scout ship and a colony ship to explore the universe. Depending on where you got placed this can mean exploring several planets before hitting a blockade of some description (typically a worm hole that you need to research some technology in order to cross) or you could be trapped with only a few measly systems to look at. It’s sometimes worth restarting the game if you find yourself in a not-so-great position as you’ll struggle to overcome that initial disadvantage as I found out several times over. There’s many different types of worlds in Endless Space ranging in size from tiny to giant and encompassing all the major types that we know (and have theorized) to exist. You’ll only be able to colonize a couple types when you first begin but as you research more technologies you’ll be able to colonize more and more of them. They all have their own advantages/disadvantages so there’s a lot of strategy in colonizing certain ones first and then leaving the others until later. This is because depending on the planet it will have one of the resources (called FIDS: Food, Industry, Dust, Science) that it produces more than others and choosing the right one can be the difference between an effective colony and one that takes dozens of turns to start working. This is probably my main gripe with Endless Space as whilst the resources are explained a bit in the tutorial menus that pop up it’s pretty easy to forget what does what and end up in a position where you can’t seem to get ahead, no matter how hard you try. Food for example is what dictates how fast your populations increase but there’s no direct way of seeing how it affects it (you can just see total food and when your population will increase and by how much). After reading a couple strategy guides it was clear that there’s a definite progression to how you should focus your resources (it’s food for pop, then industry and then science/dust depending on your play style) but the tutorials don’t really make that particularly clear. The main issue is just how many different things there are to do in Endless Space and the tutorials come so thick and fast at you initially that its hard to take it in. Ship design is one aspect that I felt unnecessary at first as I was able to get away with the default ship designs without too much hassle but its actually one of the more satisfying aspects of Endless Space. One of the research trees is dedicated to improving your ships (whilst another, which is for colonization, has the ship hulls in it) with various weapons, shields and augmentations to make them more effective in combat. 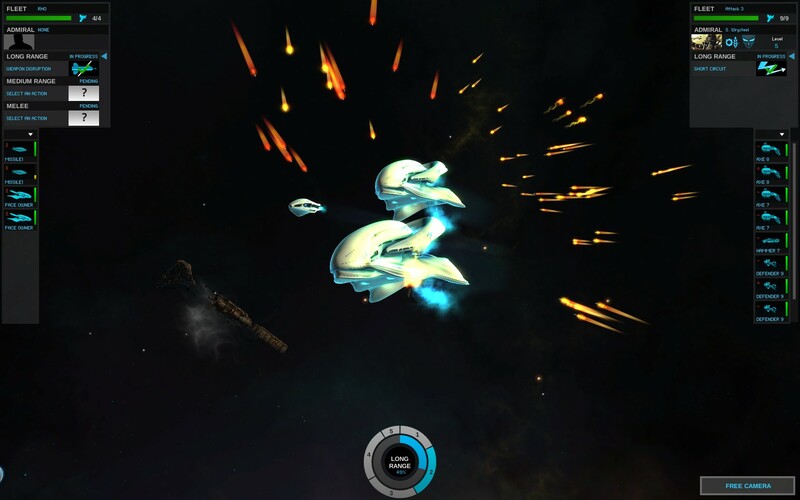 Reading some strategies online suggests that the best thing to do is to make ships specialize in a particular role as this is more effective, especially when you’re behind in technology, but I found that my FACE OWNER (pictured above) was pretty capable of eliminating most targets without too much hassle. This is probably because I had a major technological advantage at this point so your mileage will certainly vary in this regard. The combat you engage with said ships isn’t particularly great either taking the form of you simply clicking the “auto” button and waiting for the result or flipping over into manual in order to increase your chances of winning. To be honest since you get an upfront meter of how likely you are to succeed there’s not much incentive to engage when you’re not at an advantage. 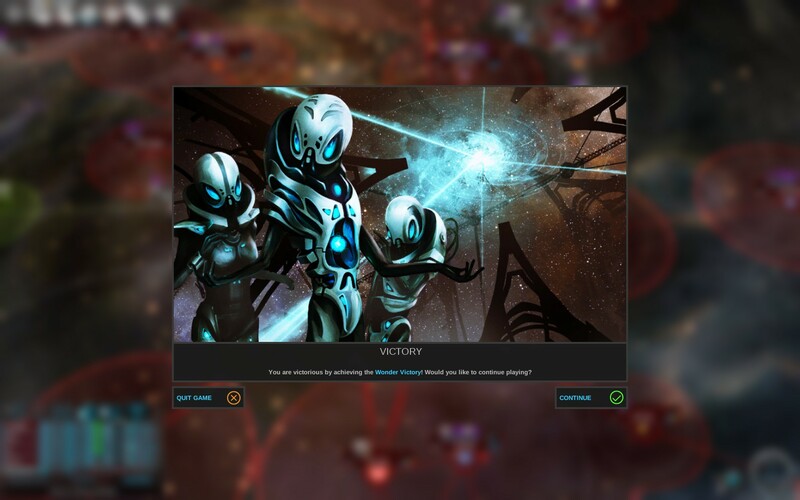 If you do decide to go manual there’s a few things you can do to tip it in your favour, like using abilities or playing cards (much like Master of Orion I’m told) but you’re never going to be able to pull off a major victory unless you’re less than about 20% different from your opponent. You can avoid conflict almost completely if you instead choose the diplomatic path and ply your opponents with gifts and open borders. I found this path to be pretty one sided as I was never able to figure out how to make deals with them that were favourable for me and not them which is something the AI does constantly. I can remember after one engagement I was offered peace but only if I offered them additional things as well even though I had military and production superiority. Of course the next course of action was to deny it and simply blockade them until it improved, which it did, but I would’ve much preferred to simply tip the deal in my favour rather than having to dedicate way too many resources to forcing a better deal out of them. Again I think this is because Endless Space is pretty comprehensive in the game mechanics it employs and whilst the tutorial gives you some insight into how they work it’s not the best guide. Thankfully there’s quite a few sites dedicated to strategies and explaining the mechanics a bit better and after reading a few guides I was satisfied that I understood the game better and was able play for hundreds of turns without getting steamrolled by an AI. This is when the game came into its own as the last 4 hours or so I spent with Endless Space were really enthralling, mostly because of the narrative I built up in my head. I was attempting to play as a colonizer, a peace race of Amoebas who would spend their time running from system to system building up a peaceful empire and leaving my opponents to their own devices. It didn’t take long for one of them to take a dislike to me, probably because I accidentally sent a ship to one of their systems, and I spent much of the initial game keeping them at bay whilst tending to a peace agreement with the other. For a long time all was good and my once fierce opponent decided to not pursue me any more, leaving me to my peaceful empire building. However my expansionary prowess did not go unnoticed and I soon found myself at full scale war. My race had not many ships but the industry I had built up was phenomenal and it was time to put it to use. My scientists were retasked to weapons research almost instantly outstripping my rivals in terms of fire power. My biggest industry systems were put on ship production duty being able to pump out a massive warship every turn that was capable of decimating entire enemy fleets without taking a scratch. My border systems were reinforced ensuring that no one would be able to invade them without giving me ample time to react. The result was a devastating show of force and after one system was invaded the enemy begged for peace and I gave it to them. However the other empire had become nervous about my new found presence and began breaking deals with me. They became suspicious of my activities and not too long later declared open war. They won many battles against me, using their superior fleet size to their advantage, but yet again my empire dedicated itself fully to war and not too long later I pushed them out of my boundaries. I then began a full fledged invasion of their territory, laying waste to fleet after fleet and capture half a dozen systems before they crawled to me with an offer of peace. I declined and continued my rampage, furious that the people I had done nothing to antagonize would declare war against me. In the end I accepted their peace offering of 2 systems and eventually won by constructing the required wonder. 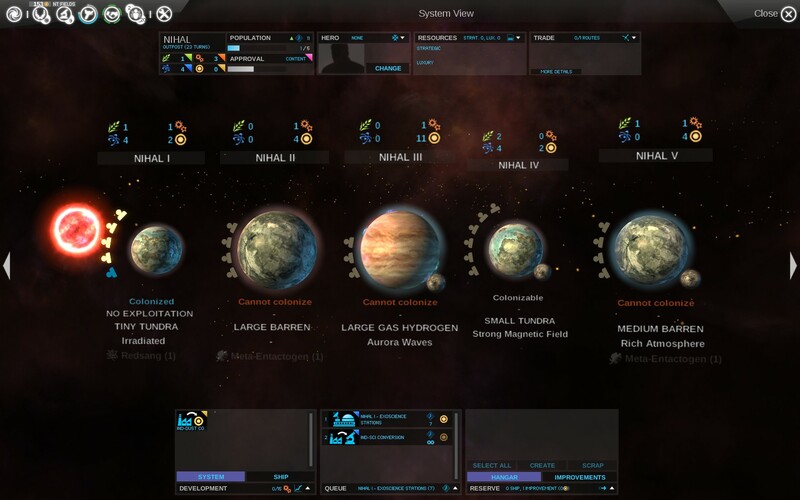 Endless Space is a game that rewards you the longer you play it, taking you from humble beginnings on a single planet to a galactic civilization that is a mighty force to be reckoned with. There’s a steep learning curve, one that could be a lot less steep with some more work on the tutorials, but once you’re over that hump its incredibly satisfying. The narrative I built in my head of a peaceful race that is not to be trifled with was a great one and it was without a lick of dialogue or a single cutscene. If turn based strategy is your thing or you enjoy games that reward methodical, calculating play then Endless Space is right up your alley. Just be sure to set aside your weekend for it – you’re going to need it. 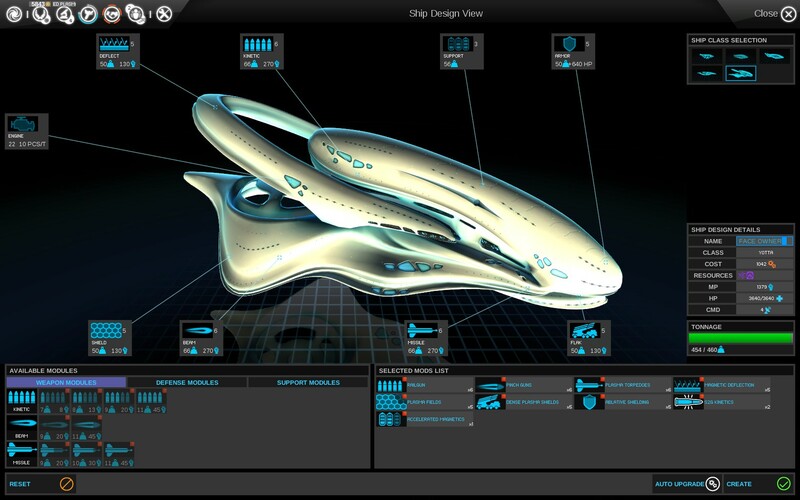 Endless Space is available on PC and OSX right now for $29.99. Game was played on PC with around 10.5 hours of total play time with only a single win at 220ish turns.